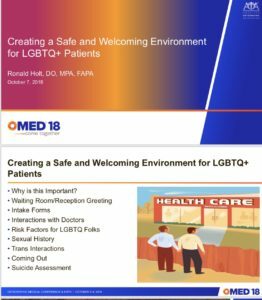 This interactive session dove into how to make the healthcare setting a safe and welcoming environment for LGBTQ+ patients, including the impact of the waiting room, intake forms, and patient interactions. In addition to discussing what LGBTQ+ patients are at higher risk for, we discussed how to start conversations on sensitive topics, such as sexual health, trans health, coming out and LGBTQ+ suicide risks. This interactive session included a robust Q & A session on LGBTQ+ health. The audience consisted of medical students, resident physicians, and practicing physicians who attended the SOMA educational track of the OMED conference in San Diego. My coming out story entitled, You Can’t Heal if You’re Hiding From Yourself, can be viewed here.